Patients and doctors can access medical history through new health data system. Turkish Health Minister Mehmet Muezzinoglu has announced on Friday the creation of a new personal health data system granting patients easy access to health services and their medical background via a web portal. 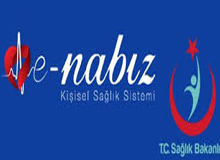 The state portal “enabiz.gov.tr,” which users can gain access to with a password, gathers patients' medical history including diagnostic reports, prescribed medication, and eases communication with doctors. “Having the world’s most developed project in this field, makes us happy,” Muezzinoglu said in a press conference in Istanbul. Thanks to the portal, doctor can see patients’ entire medical history. It also enables patients to communicate with their doctors, for example before an appointment. The portal also boasts an emergency button, which enables people to get an ambulance immediately without having to provide a location to health workers.